"Although median wages for two-parent families have increased 23 percent since 1975, the evidence suggests that this is not the result of higher wages. Rather, these families are just working more. In 2009, for instance, the typical two-parent family worked 26 percent longer than the typical family in 1975." This news is especially sobering for Generation Y for two reasons. First, since the data was taken from 1975-2009, it does not include the last year and a half of dismal unemployment data which further suggests that a recovery might take awhile to form. Since an extra year and a half of work data was not included, the results are likely even slightly worse than the 1975-2009 data indicates. Secondly, Michael Greenstone, the MIT economist who runs the Hamilton Project notes that, "The long-run decline in wage opportunities has put lots of pressure on families. People are adjusting, but they’re adjusting in ways that we might not like very much. All of that points away from a vision of the American dream where each generation is doing better than the last." Unfortunately, that last line should serve as a wakeup call to Generation Y. While it's common to see each successive generation better off financially than the last - this new data suggests that such progress may skip our generation entirely. As scary as that sounds, it simply means that as a generation, we need to alter our expectations, especially from an investing perspective. 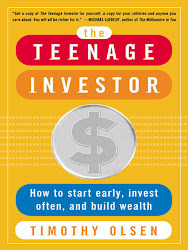 On this front, my number one recommendation to Gen Y investors is to use a 7% long-term average rate of a return in all investment calculations so as to avoid any type of unreasonable optimism and to build a cushion into all assumptions. The worst feeling in the world is building an investment plan that assumes a rate of return that is much higher than what actually happens. A 7% return is reasonable since the 10-11% long-term average rates of return that we used to see seem to be a thing of the past; now, more than ever, it's better to be safe than sorry!